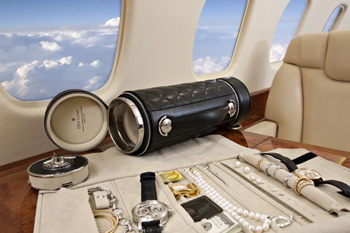 Just in time for the last minute Christmas gifts Dottling, a German company specializing in luxury lodges security, unveils his latest creation: The Guardian is the first safe pret-a-porter for the safe transport of watches, jewelry, money, credit cards and important documents. Seeing does not even seem a safe but a stylish trunk, wearing a shoulder strap, leather and can be customized: The Guardian combines style with maximum safety and is equipped with all the latest systems theft-proof. For those who travel Very often it is important to have the accessories most beloved and important documents with them, without taking too much risk. If the house you can choose from various safes, including luxury models very special, once you travel you need to make sure that the precious are safe. The Guardian is atto hold six watches, jewelery, money and documents and is equipped with everything you need to be quiet. With a weight of about 4 pounds, 25 cm long and with a width of 13.5, the portable safe has an inner core made of hard metal and coated carbon fiber and polycarbonate. The cover conceals a small “door” with security lock with three-digit combination: is inserted inside a GPS system So That the cassette can be traced throughout the world. What made it different from the traditional portable safe is the design. The upholstery is leather, chosen among the most common and the most exotic: the retail price for the leather version is about 12 thousand euro rising to € 14.500 for the crocodile leather. A small safe and secure at all times carry watches and precious jewels.